This book is one of the best books I’ve ever read. Like all great books, it’s about a lot of things but the thing that interested me most about the book was its defense of organized religion (and, in particular, the Catholic Church). It has an incredibly intellectual honesty. Graham Greene does not take any shortcuts and he does not make any excuses. He lays out his scenario with incredible skill and then he follows it to its most logical conclusion. In my little socioeconomic slice of America, it is an article of faith that organized religion does not serve much of a positive purpose. Of course, religious faith is fine (some of us think it’s salutary, others think it’s silly, but everyone thinks it’s fundamentally acceptable), but all this stuff with priests and churches and bishops and tithing and catechisms and fasting on Fridays and catechisms and creeds and religious litmus tests is all kind of silly. Since religion is fundamentally irrational, why should any person be able to set himself up as being closer to God than anyone else? In The Power And The Glory, Graham Greene writes about a 1930s Mexico that’s adopted much the same sort of belief. While it’s still permissible for people to personally retain their faith, the churches have been torn down, religious ceremonies have been outlawed, and the priests have been pensioned off, shot, or driven away. The main character of Greene’s novel is an unnamed man who is perhaps the last active priest in a Mexican state where the persecution has been particularly savage. This man travels wide circuits on his mule, staying at each village for only a day or two, conducting masses and baptisms in barns and hearing confessions in horse stalls. And at the start of the novel, the governor of the state empowers an equally unnamed lieutenant to do anything–including taking and shooting hostages–in order to capture and execute the priest. But this priest is not a saint. He is an alcoholic (and he spends a lot of time scheming to acquire alcohol, since wine and spirits are illegal in his state). He has fathered an illegitimate child. He haggles with the peasants over the price of baptisms and such. He’s a hypocrite. When he preaches, he tells peasants to do things that he doesn’t do himself. When he gives confessions, he tells them to refrain from sins that he is actively committing. There’s not that much compassion or understanding in him (there’s not that much of anything in him). And although he has faith, sometimes it seems like a shallow, rote sort of faith…not a faith that’s touched him very deeply in terms of his character. More than anything, the priest is petulant, guilty, and bewildered. He doesn’t know how he’s found himself in this position. He constantly seeks to escape from his ministry (and leave this state entirely without clerics), but he keeps getting drawn back, almost as if serving God was a weakness that he kept succumbing to. It’s clear that he’s not accomplishing much good. He’s not organizing anything or changing anything. All he’s doing is fulfilling some silly forms that the local peasants require because his church has taught them that they’ll go to hell unless the right words are said. And he’s not even doing much of that: in the last year, he’s only said four masses and heard a hundred confessions. Mostly, he’s just running from this implacable lieutenant. And the lieutenant is as virtuous as the priest is venal. The lieutenant loves children, he gives to the poor, he is personally honest. Although he kills people, he does not love doing so. He kills because he knows he has to. He believes that the Church has oppressed his people for centuries; that the Church is a tool which the landlords have used to pacify the peasants. He knows that stamping out the church is a necessary precondition of making everyone wealthier, better-educated, and happier. But…out of this loaded scenario, Greene somehow manages to demonstrate the value of the Church. Neither the peasants nor the priest can understand what they’re doing, but the ritual observance is what keeps God alive. Greene shows how God withers when it is kept trapped up inside the heart, and how faith requires some kind of community in order to remain strong. And he shows the consolations of faith. He shows how even a very thin faith is able to ennoble this priest, whereas the lack of it has sapped the humanity from the lieutenant. The most virtuosic performance in the novel comes at the end, where the priest is wondering whether he himself is going to go to heaven. Actually, the priest is not wondering at all. He knows he is not going to heaven. He knows he is damned. He’s sinned too repeatedly, and, what’s more, he’s not contrite about his sins. He knows that it would be the height of pride for him to forgive himself…it would just be another sin loaded on top of all the rest. The priest knows that what he needs is another priest–another man, acting using the spark of Godliness that is inside all men–to hear his sins and look inside him and tell him that even he is, somehow, worthy of salvation. 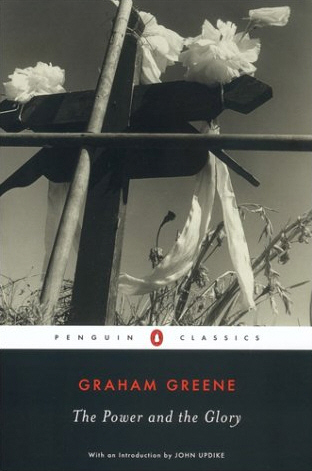 Graham Greene is a wonderful writer – subtle and deep and thought-provoking. I wonder why he is not well know. I also wonder how he can be related to Isherwood (cousins!). Yes, I’ve been very impressed by him. I enjoyed his lighter books alot too (Travels With My Aunt and Our Man In Havana). Next Greene novel on my list is The Heart Of The Matter. A proud man is conscious of the idea [that God had in vraeing man], and aspires to realize it. He does not strive towards a happiness or a comfort, which may be irrelevant to God’s idea of him. His success is the idea of God, successfully carried through, and he is in love with his destiny. Isak Dinsesen. Those two, Dinesen and Greene, remind me of each other. Your words brought Dinesen to mind today. Interesting, I’ve been meaning to read Dineson’s Out of Africa for awhile now. What books of hers would you recommend?